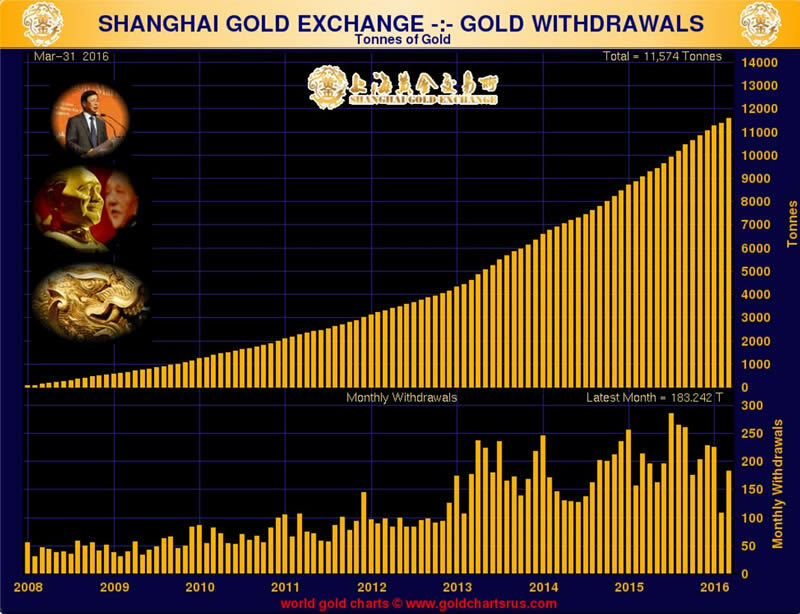 China Gold Bullion Yuan Trading To Boost Power In Gold and FX Markets – End Manipulation? China launched yuan denominated gold bullion trading today in a move that will further boost its power in the global gold and fx markets. Critics of the existing pricing mechanisms hope that it will lead to increased transparency and may end price manipulation. The Shanghai Gold Exchange (SGE), the world’s largest physical gold exchange, launched a yuan-denominated benchmark price today in Shanghai, a measure that will benefit both China’s domestic gold market and the global precious metals market. The SGE set the price at 256.92 yuan a gram ($1,233.85/oz) at the 10:30 am session after members of the SGE submitted buy and sell orders for gold of 99.99 percent purity according to Bloomberg. Members include Chinese banks, jewelers, miners and the local units of Standard Chartered Plc and Australia & New Zealand Banking Group Ltd., according to the bourse. The SGE said in a press release that the launch of the Shanghai Gold Benchmark Price will be useful as it adequately reflects the gold supply and demand in China, and represents the price trend of China’s gold market and China is now the largest producer and buyer of gold bullion in the world. Shanghai Gold is gold bars or ingots with the standard weight of one kilogram and a fineness of no lower than 999.9, delivered in Shanghai, and traded via SGE price trading platform. It is quoted in yuan per gram, and settled via the SGE platform. “At present, China’s gold derivatives market is lacking in an authoritative and equitable gold benchmark price which is denominated in renminbi. The launch of Shanghai Gold Benchmark Price will facilitate the development of China’s gold derivatives market which will also have a big impact on the price of gold related financial products, wealth management products and derivatives,” the release said. Shanghai Gold Benchmark Price follows the principle which allows all orders executed on the SGE price trading platform. The benchmark price is determined when price and volume reach the balance during the auction period on the SGE price trading system. Experts said the Shanghai Gold Benchmark Price will play a significant role in the global gold market. According to David Marsh as quoted by the official China Daily, Managing Director and Co-Founder of Official Monetary and Financial Institutions Forum (OMFIM), the yuan-denominated gold benchmark offered by SGE is a necessary addition to the international gold market and should make the pricing of physical gold more open to the play of actual market forces. “The Shanghai gold benchmark will provide a fair and tradable yuan-denominated gold fix price … will help improve yuan pricing mechanism and promote internationalisation of the Chinese gold market,” Pan Gongsheng, deputy governor of the People’s Bank of China said at the launch in Shanghai. “The Chinese gold market has rare opportunities for development,” Gongsheng said. “The market capacity and potential are huge. Today’s event will help enhance the impact of the renminbi on gold pricing,” Pan said. “(They) are aware it is a time consuming process. It is not going to happen in one day, one month or even one year,” a source familiar with SGE’s thinking said told Reuters. Transparency in the fixing process has come under scrutiny since a scandal broke out in 2012 over the rigging of the London interbank offered rate, or Libor. The London gold fix, previously set via a teleconference among banks and facing allegations of manipulation, was replaced in 2015 by electronic auctions.